Have you ever had such an experience? You often find yourself transported to the heart of a Parisian café when the aroma of freshly brewed coffee captures your senses. So what if we told you that we can achieve this from the comfort of your own home or office? Our French press coffee maker is your good choice, you will obtain an appetizing cup of coffee or tea in a few moments without coarse coffee ground or tea leaves. Whether you're dressed in your pyjamas or getting ready for work, our cafetiere is ready when you are. 1. Reliable Quality. Made of the best 18/10 polished stainless steel interior and exterior, which is unbreakable. FDA-Approved product with food grade material. Don't worry about rust and it's dishwasher safe. 2. High capacity. 34Oz/1000ml volume, it is enough for you to make about 8 cups of coffee or tea every time. 3. Double Walled Insulated Design. Double wall construction and provides greater heat or cold insulation. That means your coffee, tea etc is kept warmer or cooler much longer than the average glass piece, and outside stays normal temperature to the touch. 4. Triple Filter Extraction. With washable, durable and practical metal filter, bold plunger and spring strip, the sediment of coffee will be filtered, extracting the purest coffee and keep the original flavor. 5. Extensive Uses. 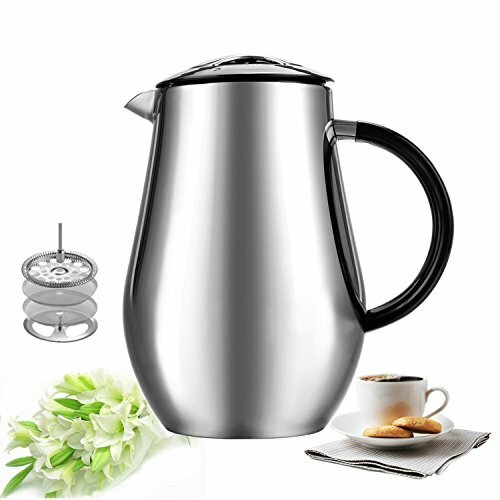 It looks attractive in stylish design and closable perfect pour spout. Be used as a coffee or tea press pot both outdoor, office and home, which is the best choice to prepare coffee, iced tea, hot chocolate, fruit juice, cashew milk, lemonades, rinse quinoa and more. Good idea for wedding, house warming, retirement, graduation , birthday, Christmas and holiday gifts. If you have any questions about this product by Sailnovo, contact us by completing and submitting the form below. If you are looking for a specif part number, please include it with your message.